One of the strengths of small business is that you can pivot. With the reach and extent of the enterprise often within a single building, or two and a half buildings in our case if you count Isla Sorna, an owner can quickly implement a policy change, a price or marketing special, or even rebuild a merchandise fixture on the fly. Unfortunately, not all decisions have consequences so quickly absorbed, analyzed, and responded to. Some decisions, if early enough and important enough, are time bombs, small mistakes in the early going that ultimately metastasize into big core problems costing thousands of dollars or more to rectify. When they can even be quantified. And when they can even be rectified. The biggest time bomb of all is, of course, going into business with a business partner who doesn't work out. It is difficult to generalize about this so I won't reach too deeply into this example, but the main points of contention usually end up being unmet expectations (reasonable or unreasonable) for the allocation of resources, control, and work contribution. I don't have a perfect system for addressing these, but our LLC Operating Agreement has done some heavy lifting over the years. It is perhaps the opposite of a time bomb. We have addressed much of the rest in policy. Accordingly, DSG has survived expensive partner departures that might have destroyed a normal store. From the eleven original LLC members, the only ones remaining are my wife Stephanie and myself. [EDIT: To address the wiseasses out there, most of the departed partners did so happily, profit in pocket, to move on to other ventures.] Two other members have since joined. It took all the partners' capital to get things rolling, but with the expense of separating the partners who left on less optimal terms, we lost enough ground that I suspect I would have been better off starting much smaller with a tighter ownership group that held a more unified vision. Here is a time bomb that explodes continuously for me and that I've been cleaning up for almost five years now. Our logo is wrong. When initially designed, the "Desert" was in sand and the "Sky" was in sky blue, with "Games" in brick. It worked nicely and was easy to read. However when monochromed, the logo instead reads "Desertsky" (think "deh-ZERT-skee" like some sort of Russian soft drink). It is basically unusable for us but we've been stuck with it for years now. That small design oversight turned into a $7,000 marquee sign that reads like the Leningrad Circus instead of instilling the sense of wonder I originally intended. Or people see it at the briefest glance and think it says "Dentistry." Even less useful for me; dentists are feared and dreaded. 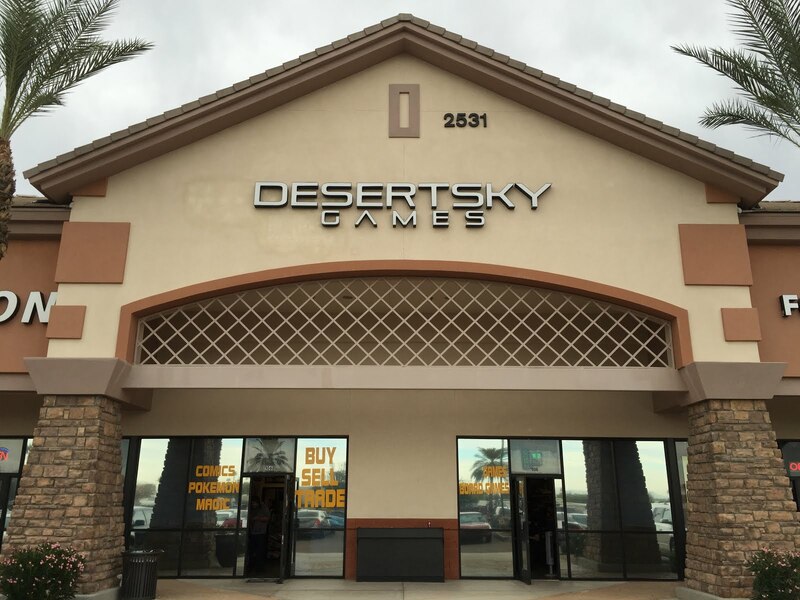 Now a new logo is badly needed for multiple reasons: Uniforming across two stores, window vinyl revamping, a new marquee sign for Tempe, the marquee for DSG New later this fall, the mall sign for DSG Superstition Springs after that, social media flyers and promotions, in-store signage for both stores, it goes on and on. I had a "square" revision made and rendered, which you see in use today on Facebook and on the store's website, but it's not working out. To make matters worse, I never did get vector assets for it, and the branding of "and Comics" has never quite resonated whether we've featured comics or not. The original logo also had a tagline I loved, "New Worlds Await," which we simply have not used. We played with a new tagline of "The Next Level," which is nice and video-game-compatible, but also haven't done much with that. Here are three of my other DSG time bombs from 2012 through 2014. If this doesn't scare potential store owners into second-guessing every tiny choice before them, I haven't done my job here today. The biggest time bomb, of course, was our lease. At the time it didn't seem that bad. People heckled us relentlessly for opening a store almost twice as big as any existing store in town, at 2400 square feet. Yeah, nice joke, huh? Now DSG Gilbert is among the smallest stores in town, and is easily the smallest proportionate to the amount of revenue it drives through those doors. We've had to climb right up the walls with sky-high fixtures and crowded conditions just to be able to operate our volume of business in this constrained space. And for that privilege, we get to pay more per square foot than about 80% of the other stores in town. (Though that's now, at the tail end of the lease, when the ramp is at its worst. The five-year average rent rate was competitive.) DSG Tempe's lease is much better, but that location suffers geographically and has inadequate parking. 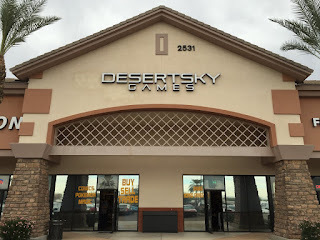 I contend that Desert Sky Games is a well-imagined brand, specific enough to have local flavor while flexible enough to be regional, easy to remember, lends well to a color scheme that isn't the same red and black as half the hobby trade uses, and is very clear as a branding for game products whether tabletop or electronic. Where we ran off course was adding in "and Comics" in 2013. While accurate, it just doesn't work. It's too long and cumbersome, it required a logo change that still didn't fix the Russian soda pop problem, and it proved unnecessary in the end, as many prominent stores like Millennium Games and The Nerd Store carry comics just fine without the word "comics" being in the title. Moreover, I have a ton of marketing history with the full cumbersome name, and the current uniforms feature it. It's the worst of all worlds. I can't fix that logo soon enough, and doing so also fixes the branding. 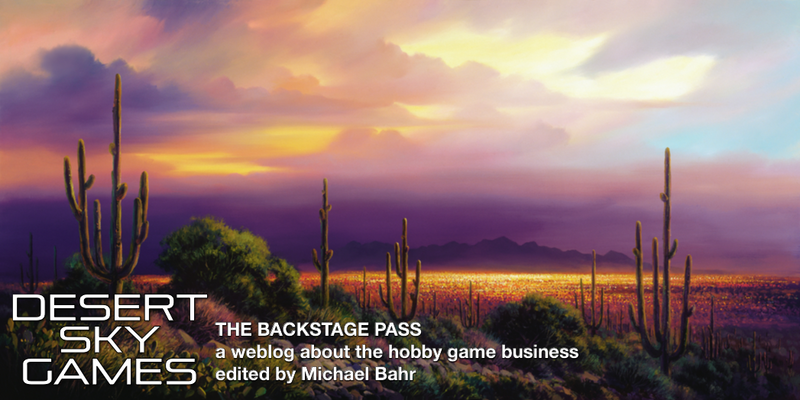 It's just going to be Desert Sky Games from now on. I then gain some flexibility to use Desert Sky Comics as a sub-brand (and I own and have secured all the IP for that as well). I set up a time bomb of missed revenue opportunity in 2014 that I regret to this day. DSG carried video games since the beginning. Early on, we didn't do much in the category. It was healthy on low volume. Former partner and original manager Mike Girard simply wasn't deeply interested in the category, so we didn't really put a lot of focus on it, but it never lost money. In summer 2014, Girard and DSG parted ways, and when I took over main operations, I hurried to narrow the category spread in an effort to conserve resources and overcome a moribund June. I moved away from vintage toys, non-sport trading cards, and the vintage arcade, none of which were substantial in the revenue mix at the time. But I also made a big mistake, which was to drop video games and sell our inventory for a pittance to the good guys at Tempe's The Gaming Zone. TGZ is a quality outfit and I've said so before in this space. Video games as a category were a very healthy thing and not something I ought to have dropped, never mind that I was worried about saving the rest. Video games returned in early 2016 and as of last month have climbed back into the top 5 categories for gross and are the #1 category pound-for-pound. Had I stuck with video games and dropped board games and comics instead, focusing only on core competencies, I could have bought back into board games and comics later with ease off a far larger bankroll. Video games aren't right for every store, but they may be a good option to consider for many stores, and they especially are worth keeping around if your store already carries them! There were other small time bombs over the years caused by yours truly. Tournament calendaring is a big one because the power of an event calendar is when it rarely ever changes. You want to catch those people who are back in town to see their families for a few days and remembered that you have Thursday night MTG Standard or Saturday night 40K. Over time it builds up in aggregate, and that's part of how stores that are open for a while build their incumbent advantage and outperform loud and charismatic newcomers. Thus even if you have a "bad" event on the calendar, it usually stays there a long time before you make a move. Staffing has led to some time bombs. Out of HR consideration I won't name names, but there are employees I held onto well past their expiration date. That has not been nearly as much of a problem for the Gilbert crew since last summer. One could argue that being stuck in troubled categories and having deadwood stock amounts to a time bomb, but I see that more as the usual ebb and flow of inventory and part of the educated guessing game that goes into ordinary procurement. It is difficult to avoid setting time bombs of your own in business, but I wish you the best of luck in containing the damage when the explosion finally hits! Thanks for joining me once again and have a prosperous week.